You probably already know about Craigslist. You’ve either browsed it to find things you wanted to buy or have used it to try to sell something you don’t need. A lot of people aren’t aware, though, that Craigslist is also a great place to find free items. You know that “Freebie” section in your local newspaper? You can list items there for free to have people come pick up for free. People use this section sometimes when they’re in a pinch and really need to get rid of something (usually when they’re moving), or they just don’t think something has enough value to sell. Craigslist also has freebie sections for each of the cities it has listings for. This section is where you can find completely free items near you. If that doesn’t sound good enough, what if I told you that you can earn cash reselling these free items you find on Craigslist? Well, you can, and it’s one of the easiest ways you could possibly make money. Some people even have a name for this kind of thing: Craigslist flipping. Some use Craigslist to purchase items to resell for a profit, while others don’t pay a dime for their finds and make a full profit. If this kind of thing sounds like something you’re interested in, then stick here for a few minutes while I explain how to get started. How to Make Money by Selling Craigslist Freebies for a Profit! Of course, your first step here is finding free products on Craigslist. Go to craigslist.org. The site will automatically try to find the city closest to you based on your location. If it doesn’t choose the location you want, you can pick another one by using the links on the right of the web page. Look over in the For Sale section and find the Free link. Click it. You now can browse through the section to find 100% free products that you can pick up from your neighbors to try to resell. If that city isn’t showing anything that interests you, you can use the drop-down menu at the top of the site to switch to another location. As I look through my local listings, I’m finding free things like scrap metal, a toaster oven, a large shed, storage tubs, a grill, a hot tub, and a TV set. You should be able to find a good variety of things, especially in larger cities, that are free as long as you can come pick them up yourself. Which brings me to an important point: be sure to have a pickup truck or a vehicle that’s large enough to hold large items or you’ll find that you won’t be able to come pick up a lot of the things you want! Many Craigslisters put things up for free because they don’t have the time or a way to move it themselves. But, it’s important to remember that, just because something’s for free on Craigslist doesn’t mean that you should automatically come get it. Some things just aren’t worth the time to try to sell because they’ll be difficult to find buyers for or may not have much value. Try not to get too excited by something being free and remember that you’re not doing this to accumulate more junk. You’re doing it to make money! As you scroll through the listings, keep in mind the potential resale value something has. If you live in a small town, you may not find a lot of free stuff locally. In that case, you might have to figure out one day a week when you can meet up with others to make a big “shopping” trip in a larger city nearby. You have quite a few options when it comes to selling your finds from Craigslist, so you shouldn’t have to look too hard to find a buyer, especially if you know the best audience to try to sell it to. Your first option is, of course, reselling the item on Craigslist itself. This can be a good option when you’re trying to find someone local for large items, like furniture. They can be very expensive to ship so you won’t make quite as big a profit if you did it that way. If you do have a pickup truck or other large vehicle, you might even make some extra money by offering to deliver the item personally to the buyer. Depending on how far you go, you could charge an extra $25 or so just for delivery. 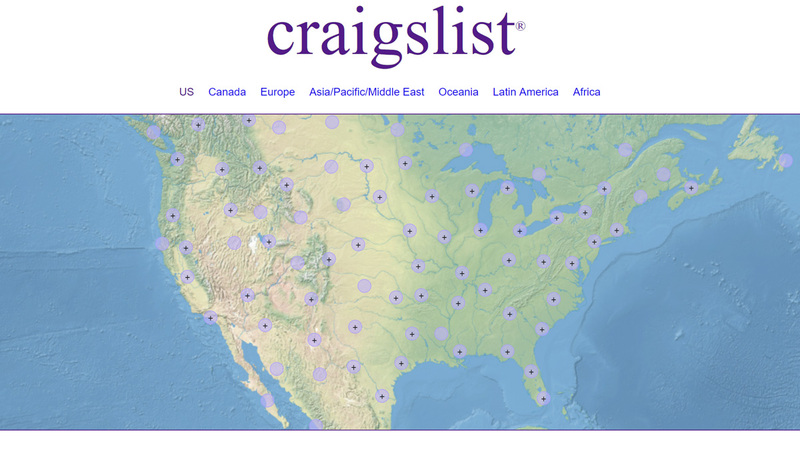 Craigslist lets you list items in several different towns and cities, so you’re not restricted to just the ones nearby. This can help you get more eyes on your items, but you’ll also need to let others know where you’re located so they can decide if they’re able to travel to you to pick something up. Another great option for selling locally – and one I often use myself – is listing items in your local buying and selling Facebook groups. Cities and counties all over the United States have their own Facebook groups. Read the rules before you start posting. Most admins will set some boundaries, such as how often you’re allowed to post, what types of items might not be allowed, and whether or not you can bump posts to the top for more interaction. Facebook groups are active and easy for people to find what they’re looking for through searches, so I personally think they’re one of the easiest ways to find buyers without doing much work. Just be sure to have pictures on your listing and check the post every few hours to see if anyone’s asked any questions you can answer. Read More: 17 Ways to Make Money from Facebook Page Likes For Beginners! eBay is a good place to sell small items that people might collect. Some people also have a lot of luck selling things like clothing, DVDs, and books on eBay. The good thing about eBay is that you can sell both new and used items as long as you’re honest about the condition of them in your description. People make a living selling on eBay all year long, so it’s possible that certain items you found for free can do really well here. One important note: eBay buyers do love unique stuff, so selling your items that are part of a collection or are vintage is probably your best bet. Yard sales and flea markets still exist! They may not be as common as they once were as the internet takes over selling stuff, but they’re still there and loved by many. Selling your free finds at yard sales and flea markets can be helpful for low-priced items that you may not be able to sell anywhere else. You might want to try to sell anything that you do think you can get a decent price for with one of the other methods and save the yard sales or flea markets for anything you have left over. Try setting up a neighborhood yard sale by enlisting the help of people who live near you. Plan it for a full weekend and get as many people involved as possible, which is likely to give you way more traffic than you’d get if you had a solo yard sale. Some of your free finds may be best in the hands of specialty buyers. For example, if you picked up a bunch of construction materials and supplies, like tools, rocks, and scrap lumber, who do you think would be the best buyer for that? Probably someone who’s gearing up to do some remodeling in your neighborhood or even a local lumber yard or construction company. Think outside the box to find the right buyers for your stuff. Free scrap carpeting may be something that a local daycare wants to buy to create a colorful carpet for a toddler room. Your jewelry finds might be the most profitable going to the local pawn shop, or a jeweler might even be interested in purchasing them after appraisal. Think of who the target buyers would be for everything you picked up and don’t be afraid to ask if they’re interested. This is where the fun comes in: turning what you bought into something new! Repurposing your items into something better than what they were when you got them for free is a great way to earn more money than you could if you were just to turn around and sell them. Clothing could become baby blankets, baby clothing, or even doll clothing. Turn wooden scraps into handmade pieces of furniture. Or, upcycle an old, worn-out coffee table by painting it or staining it to make it look like new. I’d suggest turning to Pinterest and creating some boards for upcycling inspiration, so you always have new ideas handy no matter what free items you pick up. See how easy it could be to make money from your free Craigslist finds? There’s no special experience or skills needed. You just need to know where the right audience is lurking and how to target them for the best chances of selling your specific items! Does this type of money-making venture sound like something you’re interested in? We’d love to hear your thoughts in a comment!